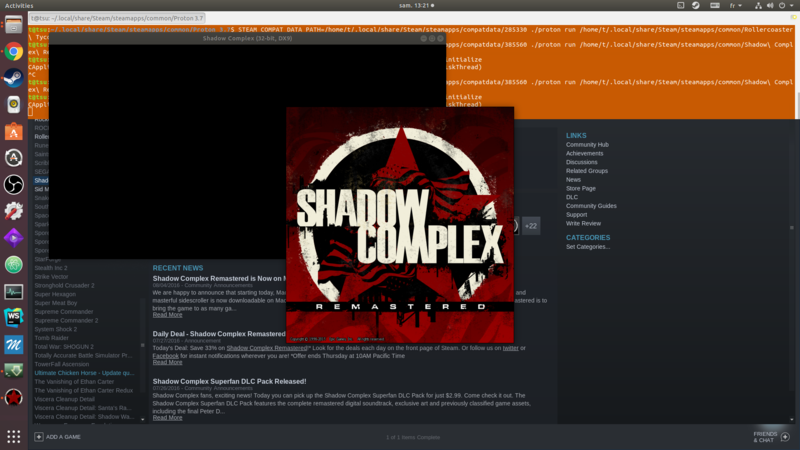 Recently Steam released Steam Play, which uses their fork of Wine hosted by Steam called Proton (GitHub) to allow us to play our complete games library under Linux. It creates wineprefixes for all of your games that don't already have a Linux port and works a far cry better than wine. I'm trying to run Supreme Commander - Forged Alliance (Steam App ID: 9420) and play it on its unofficial multiplayer client, FAF. The game used to work with Wine, but now has a number of issues (for example, fullscreen doesn't work and high tendency to blackscreen in windowed). But it does work with Proton. What I'm trying to do here is run this specific Steam game via terminal, not via Steam's GUI. My intent isn't to circumvent Steam DRM, which running the games via terminal likely wouldn't accomplish anyways, but to run it with dynamic arguments. This will allow setting up multiplayer matches. This will be applied to other games in the future. Age of Empires 2 HD fails, but with a much more verbose error message window stating steam must be running, but I had Steam running at the time (and it would run if I clicked the play button in Steam). Bannerman: there is no message at all and even less terminal verbose. So no game seems to run successfully via this method. WINEPREFIX="/home/t/fa-wineprefix/"  "/home/t/.local/share/Steam/steamapps/common/Proton 3.7/dist/bin/./wine"   "/home/t/.local/share/Steam/steamapps/common/Supreme Commander Forged Alliance/bin/SupremeCommander.exe"
0013:err:service:process_send_command service protocol error - failed to write pipe! so now we know more about the issue. it seems despite steam being running and every measure to let it know where steam is it does not find steam. I also tried the same thing from inside the proton folder with the same result. os.environ["STEAM_COMPAT_DATA_PATH"] = home + "/.local/share/Steam/steamapps/compatdata/9420"
exe = "\"" + home + "/.local/share/Steam/steamapps/common/Supreme Commander Forged Alliance/bin/SupremeCommander.exe\""
TL;DR: How to run a Windows Steam game (that manages to run via Proton on Linux) from the terminal. Here's an experiment that may help you get the answer. For convenience, I'll refer to your default Steam library location as $STEAM (the default is ~/.local/share/Steam/). Proton is installed by default to $STEAM/steamapps/common/Proton 3.7, I'll call this $PROTON. "$PROTON/dist/bin/wine-preloader" "$PROTON/dist/bin/wine" "Z:\$STEAM\steamapps\common\The Witcher Enhanced Edition\System\witcher.exe"
Where $STEAM has backslashes instead of slashes, as it's a Windows path. In addition, it set something like 70 environment variables (related to Wine, Steam, various hardware/drivers, libraries, etc.). A single variable, WINESERVERSOCKET referred to the wine server started for this instance. If I omitted this variable and used all the rest, I could start the game from the command line. printf "%s\n" '#! /bin/sh' 'env --null | grep -vz WINESERVERSOCKET > ~/env' > "$PROTON/dist/bin/wine-preloader"
printf 'exec %q "$@"\n' "$PROTON/dist/bin/wine-preloader-orig" >> "$PROTON/dist/bin/wine-preloader"
It saves the environment, except for WINESERVERSOCKET, in ~/env, the command to run and arguments in ~/cmd and runs the actual file with the arguments provided. It uses ASCII null characters to separate everything, since the actual environment variables may contain newlines. Note that I save the command with -orig added for convenience. Run the game from the Steam GUI. The wrapper script will create these files. -d '' here tells bash the files use the ASCII null character as delimiter. This much was sufficient for The Witcher to run for me. All of those environment variables probably won't be necessary. I leave it to you to test which aren't. -applaunch <appID> [launch parameters]  Launches an Game or Application through Steam. So Steam did pass on foo and bar as arguments to the game. This might be all you need. Not the answer you're looking for? Browse other questions tagged command-line wine games steam or ask your own question. Garry's Mod Add on Folder?